For this edition of Eff, Marry, Kill, I decided to use my love of reading for inspiration. I used to do a weekly series titled "Friday's Fictional Hotties," so some of these guys have been reused but hey, that just happens sometimes. Haha! Since everyone tends to read different books, I thought I'd stick with classics (don't even try to tell me that Anne of Green Gables isn't a classic. Seriously. Don't do it. I'll punch you. Okay, I won't punch you but I'll totally roll my eyes). Holy Hotness, Batman (and not just because Laurie was played by Christian Bale in the movie adaptation. Did you see what I did there? Bahaha, I'm hilarious. Okay, moving on). He was a cocky guy in the beginning because he was a spoiled little richie-rich, but Jo March wasn't having any of that. Sure, he was heartbroken when, years later, Jo rejected his marriage proposal but that just made him more brooding and intense and, therefore, even hotter. Because I love me a cocky jackass, Laurie's a sound choice for effing. For those who don't know, Gilbert Blythe is Anne Shirley's nemesis-turned-love-interest. He calls Anne "carrots" on the first day of school, on account of her red hair (the nemesis-inducing-act, obviously, because you NEVER make fun of a girl's hair). Then Anne breaks her slate (tiny chalkboard) over Gil's head, which basically makes Gil fall in love with her and follow her around like a lovesick puppy until he wears her down she realizes he's awesomesauce. It takes a while but eventually, she gives in. How could she not? Also, he ends up becoming a doctor, so if we got married, we'd be living it up and I'd probably get starring role in The Real Housewives of Prince Edward Island. Gil's hotness, sweetness, and potential for a six-figure income make him the obvious marriage choice. I mean, he wears a cape. Do I really need to elaborate? (okay, I will). In my opinion, Heathcliff can be summed up in two words: Mr. Whiner-Face. There are some who think that Heathcliff is the ultimate tortured soul (which somehow makes him attractive) but, frankly, I just want him to shut the eff up. So what he overheard Catherine saying that she thought marrying him would "degrade her," up until that point, he wasn't exactly winning any awesome prizes. And yes, Catherine's brother Hindley was a total douche-bag to him but still, Heathcliff spent way too much time wading in the self-pity pool. I remember a girl in my high school class saying something to the effect of "Oh, but he's an orphan and he grew up with everyone hating him." My response was something like: "So do a lot of other people but they don't turn somewhat psychotic and spend the rest of their lives punishing everybody else while still thinking they're the real victim. I mean, get over yourself, already." If memory serves, my English teacher gave me a standing ovation. Okay, not really. Anyway, so for the above mentioned reasons, Heathcliff's gotta go. How about you? 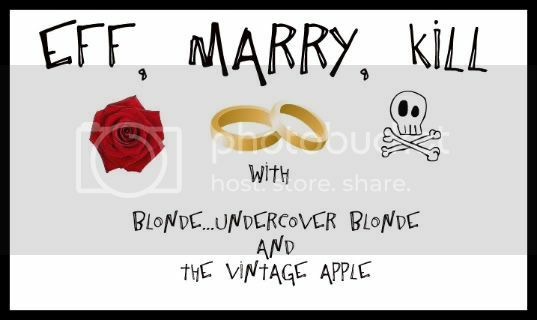 Are there any literary characters you'd eff, marry, or kill? I can't wait to read about who everybody else picked! Thanks to Heather and Michelle for hosting! I freaking LOVE this link-up!! 'Wuthering Heights' is my favorite book evah, but Heathcliff was never marriage material, so obviously he's my eff. Laurie Laurence is definitely my marry, and not just because in the movie he's Christian Bale. That doesn't hurt, though. If you marry Laurie, your vacations will be in Europe. Awesome. Great choices! I agree with you. I've been in love with Gilbert ever since I read Anne of Green Gables. Hard pressed to think of a sweeter man ever (even if he went through that whole torment your childhood crush thing). Never read Little Women, but I could do Christain Bale. Heathcliff is way too mopey for me. I mean he leaves his girl to marry someone else and then mopes when she does. And he never gets over it! love that you took the literary route! I think I'd marry Laurie, part of me just wants to save him from his pretentious-ness and he was so sweet with Amy when he met her later in life, so I see potential. I'd off Heathcliff too, that cape is TOO much. I'd eff Gilbert, just because. LOVE that you did literary characters! I'm with you 100% on each of these! Especially the Gilbert Blythe one! SIgh....he has been one of my favorites for YEARS! I would be a member of his fan club any day! :) Stopping by from the link up!